A decade ago Brian Cahill became the victim of the greatest tragedy any parent can endure with the loss of his firstborn son, a veteran police officer in the aftermath of a painful divorce, to suicide. Far from the carefree retirement he had envisioned, the devastated father faced a journey back from the brink of utter despair. As the author of numerous opinion pieces and essays on religion, the lifelong Catholic was familiar with the concept that the cross is followed by the resurrection, and that from death comes new life. In the devastating years following his beloved son's suicide, the abstract became very real. Cahill's work volunteering with two different groups--cops and cons--saved him, allowing him to eventually experience a measure of grace. The unlikely combination of working with SFPD officers on suicide prevention and leading a spirituality group for San Quentin lifers brought him enough of a sense of peace and acceptance to truly want to continue living. 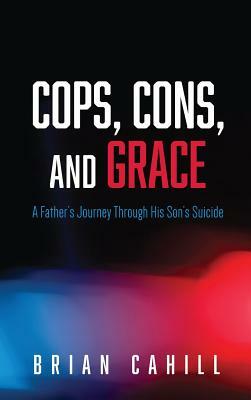 ""Cops, Cons, and Grace is a moving, inspirational journey into grief, despair, and ultimate reconciliation prompted by the author's loss of a police officer son to suicide. Written with tears and tenderness, Brian Cahill explores his own loss and the ongoing, national crisis of suicide in law enforcement. . . . Cahill came to craft a masterpiece of writing, a touching and insightful piece of literature that should be read by police officers, their families, those in the helping profession--and anyone touched by the tragedy of suicide."" --Andy O'Hara, Founder, Badge of Life ""Brian Cahill's story of his son's death provides us all with something more than science; it opens the door to the why's of suicide among police officers. I hope that all who read this touching book will walk away with a better understanding of these men and women who serve and protect us from harm. More importantly, I hope that all will better acknowledge the psychological danger of being a cop. Sometimes that danger is more than what happens on the street."" --John M. Violanti, Author of Police Suicide: Epidemic in Blue ""Heartbreaking, courageous, and generous. A deeply spiritual man, Brian Cahill turns a father's love and grief over the suicide of his police officer son into a gift. If you know a cop, a convict, or the pain of loss, Cahill's memoir will give you hope."" --Ellen Kirschman, Author of I Love a Cop ""Authentic, evocative, and transformative, this journey of healing and hope captures the heart of any reader who has been a parent, a counselor, a peace officer or any combination of these."" --Eve Myer, Executive Director, San Francisco Suicide Prevention ""A riveting story of God's grace and healing in the face of the most profound loss and grief. Brian Cahill's compassionate work with both prisoners and law-enforcement officers, after the suicide of his son, is a compelling testimony of faith, hope and love."" --James Martin, Author of Jesus a Pilgrimage ""An inviting, palpable, powerhouse of a book, Cops, Cons and Grace takes us on a story we will never forget. From a father's deep, unconditional love of his son, John Francis Cahill, to the darkest depths of pain and despair after he loses his police officer son. This book will show you desperate hurt from such a loss, but more important, it brings us closer to the minds of officers to whom Brian gives the gift of hope every day. Brian Cahill is my new hero. This book will widen your lens, while opening your heart to healing, recovery, growth and grace from the abyss that is suicide."" --Kevin Hines, Author of Cracked Not Broken, Surviving and Thriving After a Suicide Attempt ""Cops, Cons and Grace is about two very different cultures and how these cultures offered peace and resolution after a suicide. It is a moving story about how the police and prison inmate cultures lead one man to forgive himself for his child's suicide. Ultimately the book is about the love a parent has for a child and what happens when that chi.